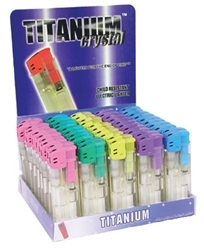 These transparent refillable click-style lighters come in 5 assorted colors. There are 50 regular size electronic lighters per display. Average Customer Review: 1.5 of 5 Total Reviews: 2 Write a review to tell others what you think about this item. This is the first time that I have purchased these lighters and it will be the last. Some are empty; some are half full; some have just a little bit of fluid in them. I was never so disappointed. Some one better start checking these lighters before sending them out. Maybe they are just old, but what a waste.